About 25 years ago, the Holiday Inn Express® brand pioneered a new kind of hotel. A few years later, with its ground breaking TV spots and its brilliant tagline, Stay Smart®, the brand launched what would become a long-running campaign that introduced a new catchphrase into pop culture: “No, but I did stay at a Holiday Inn Express last night!” The Stay Smart campaign helped drive the growth of the Holiday Inn Express brand from three hotels in 1991 to more than 2,400 today. “Over the years, the campaign has done such a nice job of helping us to weave our brand into culture in a very relevant way,” said Seth Freeman, Brand Marketing Director for the Holiday Inn Express®, The Americas, IHG. The campaign has also been a rarity in the fast-moving world of marketing: It has staying power. The Holiday Inn Express brand has a tremendous opportunity in reaching a growing target audience of Millennials who qualify as Smart Travelers. This group is online and mobile: A brand isn’t going to reach Millennials effectively with 30-second TV spots. Millennials use DVRs to skip ads, they cut cords, and they are time shifting their viewing. Holiday Inn Express brand set about finding an alternative to reach its audience — while staying true to the comedic spirit of the Stay Smart campaign. Mindshare’s research showed that the Millennial target audience was on social media. To communicate with this group, the Holiday Inn Express brand turned to Ogilvy to create an approach for reaching Millennial Travelers. Working with Ogilvy, the brand seamlessly shifted its Stay Smart campaign to a heavier mix of digital and social media media networks, such as LinkedIn. Using playful online videos that feature actor and comedian Rob Riggle, the Holiday Inn Express brand has been able to generate millions of shares and break through to reach the audience the company wanted. “I think that’s in our DNA: the comedic approach,” said Jason Aspes, Executive Creative Director at Ogilvy & Mather, Atlanta. Together, the Holiday Inn Express brand and its agencies have continued the success of the Stay Smart campaign. The comedic tone, driven by Rob Riggle, helped the brand boost its online awareness by 8 percentage points and its consideration intent by 5 percentage points. Additionally, the Holiday Inn Express brand’s presence in the top three preferences rose by 4 percentage points. 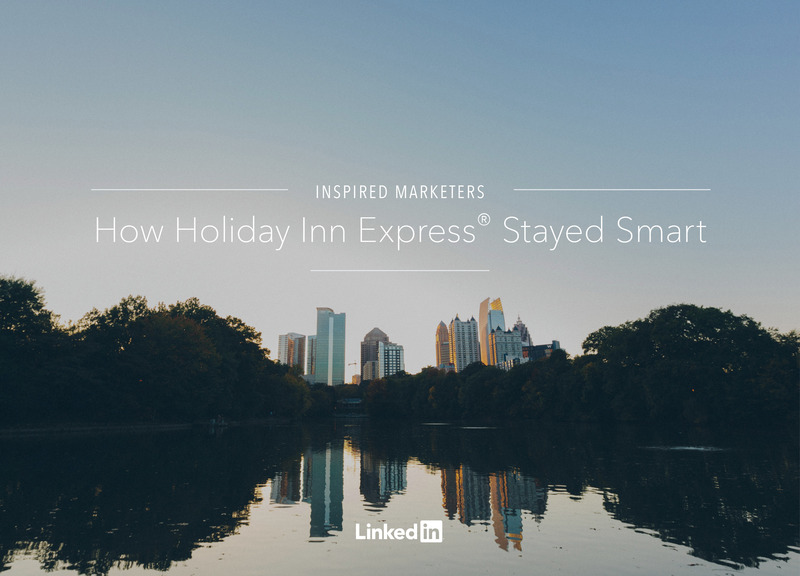 And on LinkedIn, the Holiday Inn Express brand used comedic videos to beat Sponsored Updates engagement rate benchmarks by 45 percent. “We love LinkedIn and the partnership we have, and we’re looking forward to doing more,” Freeman said.